I hope everyone has a lovely Tuesday. Today my time to post at Sweet Pea Stamps, and i choose this gorgeous image "Blue Fae" by Marlon Teunissen. Also i used rubber sentiment by SPS. Image colored with Copic and touch of Ice Crystal paint. Thanks for looking and see you next week. Wings Of Hope. 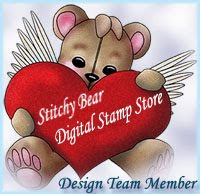 DT Card At Sweet Pea Stamps.